A pubgoer who stabbed a doorman who refused to let him in while carrying a drink has been jailed for 14 years. 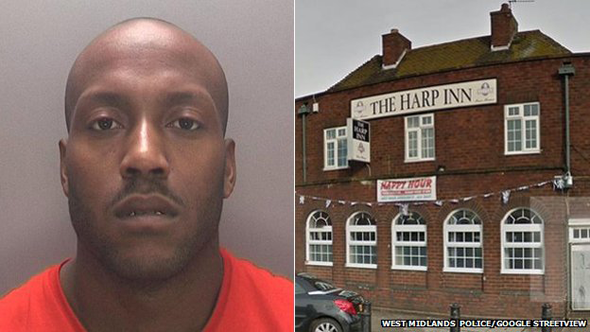 Craig Birch, 31, attacked the bouncer, who had stopped him entering the Harp Inn in Wolverhampton because he was carrying a bottle of beer. Birch, of Inkerman Street, Wolverhampton, admitted "scuffling" with his victim, but denied stabbing him through the heart with a knife. He was found guilty of wounding with intent at Wolverhampton Crown Court. Det Sgt Indi Basra from West Midlands Police said: "The stab wound − which was around 10cm deep − required a life-saving heart operation, and also led to a bleed on the brain. "They were shocking injuries from which the man is likely to be affected by for the rest of his life… and all because Birch took offence to being asked to finish his drink before coming in the pub."